Episode 15 - This episode is about Krishna's spectacular entry into international politics. Having established his manhood by cuckolding the entire tribe of cowherders, Krishna returns to Mathura to get his revenge on Kamsa. Killing Kamsa has repercussions, however, because Kamsa had a powerful ally in King Jarasandh. 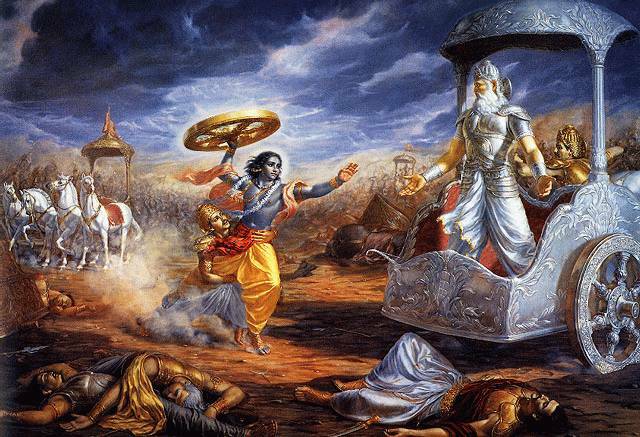 Krishna ends up killing more than 130 million soldiers as he defeated 17 armies raised by Jarasandh and an 18th army belonging to the Black Greek. You'd think there were no soldiers left in ancient India after that, but Krishna is only getting started! Krishna also checks in on his cousins the Pandavas, sending an embassador to report back on how the boys are being treated. Our two stories are beginning to come together, so next episode we'll have some more adventures of Krishna and Balaram, get them married off (16,000 wives!!! ), and see how their sons come along, and then we'll finally be caught up, and will resume the story of the Pandavas. I listened to a few minutes and was captivated by the story telling. Very good diction & modulation. You could probably slow the pace a notch down so that the meaning can be fully absorbed. Keep it up. You're doing a great job! Out of curiosity have you researched some of the pronunciation of the names? I'm curious because being raised Hindu, the pronunciations I remember are very different. For example, I never heard "DavAki" (stress on the A) but rather "DEvaki" (Stress on the E, and pronounces like "Dave" or "Wave." At the same time, despite my hindu/gujarati roots, my pronunciation is pretty bad too so I'm not sure I have the right pronunciation. Keep up the good work! It was so interesting to hear Radha so briefly mentioned, must have been later stories that got mixed in. You're doing a great job! Have you researched the pronunciation? For example, growing up, I had always heard Devaki pronounced "dEvaki" (stress on the e, first syllable pronounced like "dave", or "wave") not "davAki." Obviously with so many names it must be difficult to get them all right, and plus I may be misremembering the name myself (and Gujaratis tend to drop the ending "a's" of Sanskrit words, so I may have heard things wrong. Thanks for the encouragement. Way back in episode 1, I warned you that my pronunciation would have problems. Even though I only know a tiny bit of Hindi, I try really hard to listen how the names are pronounced. In some translations they put accent marks to help, and intry to pay attention to that, but alas, my bhagavata purana does not have pronunciation aids so I'm left guessing! If you'd care to share any other corrections, I'd appreciate it! I want to thank you so much for all the work you have done on thie project, I have always wanted to listen to the Marhavarata. I watched some older vhs versions of it when I was living on a ashram in North Carolina, but was not able to get though them all and I never that I would find the story online. You make it very easy to understand. I just started 2 days ago and I am on episode 25. I will also go to uptube as you suggested, thank you for bringing something of quality to listen to.